Andrew found a way to repair the bear, so he’s no longer looking. 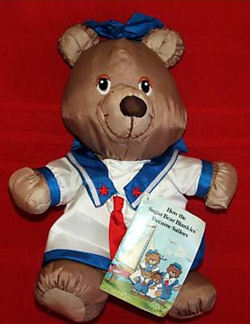 I’m looking to replace a plush sailor bear. It was made by Potpourri Press and may be called the SUGAR BEAR BLANKIES. Ours has been in the family for over 20 years and was unfortunately chewed by a puppy. I found a potpourri press bear. Not the sailor one. Maybe you could dye it brown and use it to repair yours. ebay Item number: 310240335519 HERE IT IS!!! sorry, guess that is the girl version.